Virginia's historic basketball loss is America's gain. 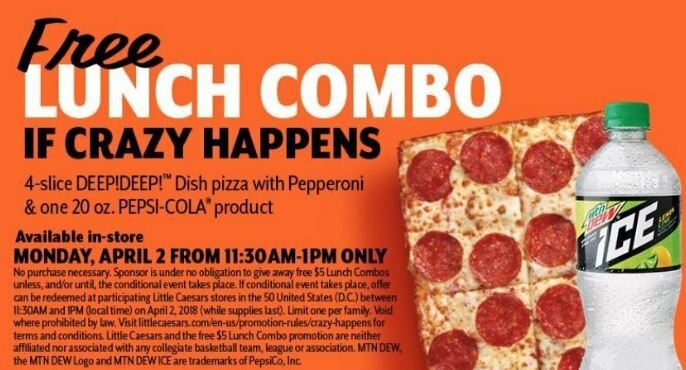 And that means Little Caesars has to give away free pizza to everyone on April 2, between the hours of 11:30 AM and 1:00 PM. Or, as Little Caesar's phrases it, "crazy happened". When the University of Maryland-Baltimore County pulled off one of the biggest upsets in sports history Friday night, the Retrievers weren't the only big winners. Still, the free deep personal pizza and 20-ounce Pepsi product is entirely free, no $5 required. PLEASE READ! : Here's the fine print. The best bet would be to show up closer to 11:30 a.m., when the promotion starts, to make sure you're one of the first to get the deal! Each location is under no obligation to honor the offer, but most will be part of the event. The offer is only available at participating stores in all 50 states and Washington D.C. Only one combo is available per family. An important point: the order must be placed by 1 p.m.
For the full set of rules, go to the Little Caesar's website.